Lazy Seamstress: Printing ink under my fingernails. 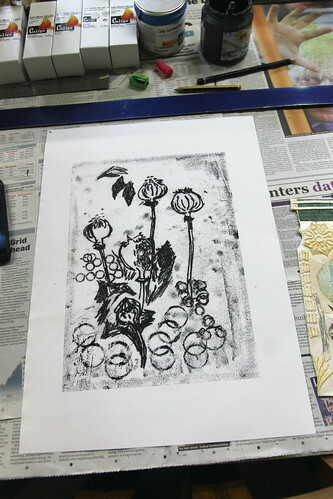 collograph printing 1, originally uploaded by indiaeden. I have had the best day! I attended a workshop today with artist Joanna Allen. Joanna is local and I've known her to say hello to for several years, we have lots of mutual friends and her son was at primary school with Eden. Recently I bumped into her as she was leaving her studio in an old mill I pass daily. I knew Joanna ran printing workshops, but had always been either too busy or too shy to ask her about them and book myself onto one. This particular day I was feeling very low, I'd been crying on my school runs behind my sunglasses and just generally feeling very sorry for myself. Seeing Joanna, I decided to be brave, shake myself out of the doldrums and ask her about her workshops. I'm so glad I did! 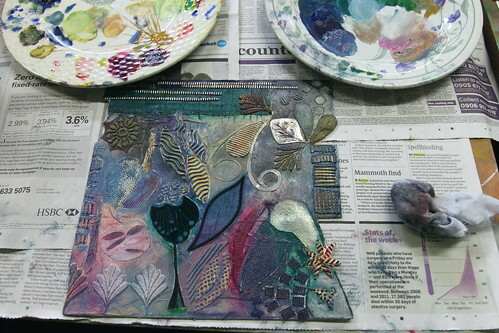 I've had a lovely day playing with textures and shapes and inks. I was a bit nervous and too scared to take along my rather sad sketchbooks to a proper artist's studio, so had to just play with shapes and see what happened. 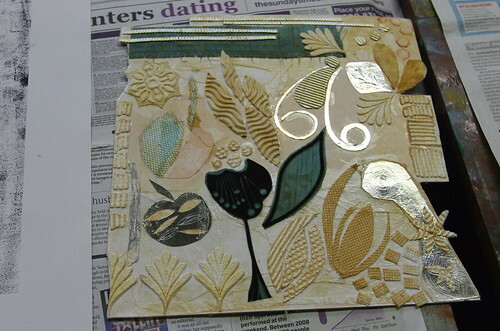 I spent most of the day creating this piece (above) for collograph printing. Joanna said to treat it like a sampler, try out textures and see what worked. 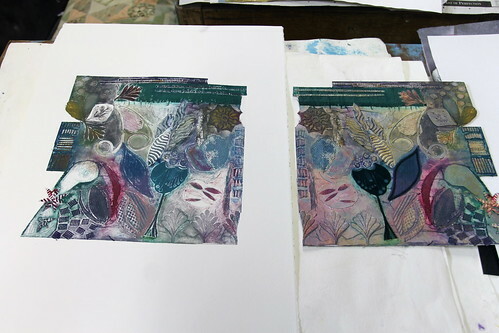 While the shellac dried on this piece ready to print I had a play with some monoprinting. I had no sketchbooks to work from, so using an image on one of my pinterest boards I sketched these poppy seed heads, they are not great, but today was more about the process than the final result, and i can at least use this print as the basis for something else. Once the shellac had dried on my collograph piece, it was time to ink it up. Joanna showed me how to apply the ink and gave me lots of tips on effects I could achieve. There are elements in this print that I really like. I can see lots of possibilities for further experimentation. I'd never done collograph printing before, and I think it's something I'd really like to play with more. Most importantly, spending the day in Joanna's studio has put a great big smile on my face. I had so much fun playing with papers and glue and ink. I love having printing ink under my fingernails again!